Sketch-based queries are a suitable and superior alternative to traditional text- and example-based queries for 3D shape retrieval. 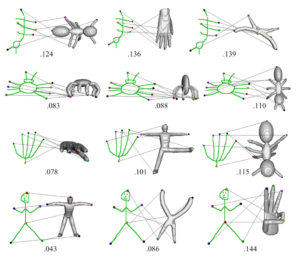 The authors developed an articulated 3D shape retrieval method that uses easy-toobtain 2D sketches. It does not require 3D example models to initiate queries but achieves accuracy comparable to a state-of-the-art example-based 3D shape retrieval method. Authors: Y. Sahillioglu, T. M. Sezgin.